After the defeat of Darius III at Guagamela and his subsequent assassination by his own officers near Ecbatana, Alexander declared himself High King of Persia. As High King he had despotic power and slowly developed into a despotic and tyrannical person. He realized that he could not keep such an enormous empire together if he did not have a good relationship with its inhabitants. He started to dress and act more and more like a Persian in the hope of establishing this relationship but the result was that he alienated himself from the Greeks and Macedonians. Alexander marched his troops through Parthia in eastern Mesopotamia and, in relatively minor skirmishes, subdued those cities that resisted him. Alexander entered India in 327 BC, encountering some of the toughest fighting of his career in the crossing. None of the Greeks had ever encountered anything to prepare them for India. The terrain , the monsoons, the fierce tribes, all combined with the long years of campaigning had taken some of the heart out of the Macedonians. In the spring of 326 BC, Alexander crossed the river Cofen and entered Taxila. King Taxiles equipped him with troops in return for aid against his rival, Porus, who ruled the lands between the Hydaspes and the Acesines rivers in India. In June 326 BC Alexander fought his last great battle on the left bank of the Hydaspes against Porus, one of the most powerful Indian kings. Porus was powerful both as a man and as a king. He stood seven feet tall, a widely feared ruler and warrior. He fielded an army that was a match for the Greeks, but Porus army had an additional advantage: war elephants. This marked the first real encounter with elephants in battle, and it terrified the Greeks. Worse yet, Alexander met Porus during the monsoon season and faced him across a river in flood. Alexanders army crossed the heavily defended river Hydaspes in dramatic fashion during a violent thunderstorm to meet Poruss forces. Porus set up 200 war elephants, 100 feet apart and in the space between the elephants, but a little behind them, he placed his infantry. The elephants were key because the horses in Alexanders cavalry were afraid of them. 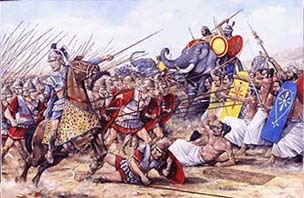 Alexander realized that he had to attack some area other than the elephants so he decided to go after the enemys cavalry and ordered his phalanx not to attack until his cavalry had sent Porus army into disarray. The enemys cavalry was surrounded and fled behind the elephants. Alexanders phalanx now advanced and were charged by the elephants which stopped the phalanx in its tracks. Eventually Alexanders light infantry gained the upper hand, as the elephants were stripped of their mahouts or hamstrung by axes. The Greek phalanx in lock shield formation advanced slowly in a solid wall of pikes causing the elephants to stampede the Indian infantry. The Indian army broke and fled. Some 80 elephants were captured and many Indians were killed in the pursuit. The battle had raged for eight hours and the Macedonians suffered many casualties themselves, more than in any other campaign. Alexander captured Porus, who had been wounded in the battle, and, like the other rulers he had defeated allowed him to continue governing his territory as his vassal. He even subdued an independent province and granted it to Porus as a gift. In this battle Alexanders horse, Bucephalus, was wounded and died. Alexander had ridden Bucephalus in everyone of his battles in Greece and Asia, so when it died, he was grief stricken and founded a city in India in his horses name. Having secured the upper Indus River valley, Alexander began to push into the interior of India where the kingdoms and cities were formidable and appeared to be endless. At last his men refused to go any further and Alexander gave the order to return to Persia. The empire that Alexander had created was largely composed of the former Persian Empire. Alexander had embraced many of the customs and traditions of the Persian people. He required that all those who came to him on business bow and kiss his feet as if he were a god. This was a normal tradition for Persians, but the Greeks were offended by it and refused to do it. During a long drunken drinking bout with both Greek and Persian friends, Cleitus, one of Alexander's oldest friends, began to ridicule the Persian guests who were praising Alexander. 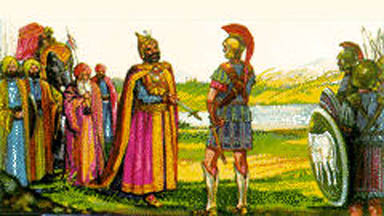 Alexander told him to stop but Cleitus did not and the two men nearly came to blows, stopped only by Alexander's guards. 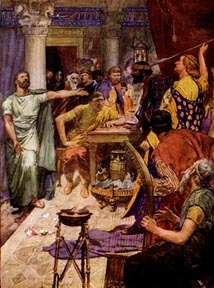 Cleitus was removed from the room, but reappeared still yelling insults. Alexander grabbed a spear and killed his best friend. Alexander, realizing what he had done, attempted suicide but was stopped by the guards. Alexander mourned for three days, but his army was not impressed. The soldiers mutinied and demanded to be sent home. Not long after the incident with Cleitus, Alexander fell ill with a fever and died; some claim that he was poisoned. Alexander was just thirty-three years old. When asked on his death bed who was to be his succesor, he is said to have replied "To the strongest." According to legend, his body was placed in a gold coffin and carried to Memphis, Egypt, and later taken to Alexandria and placed in a beautiful tomb, however, his tomb has never been found.